Curious about why you should create an annual family budget? Well, having a budget for the entire year can be a huge blessing when you’re trying to reach your financial goals. You’ll be able to easily see what bills you have coming up that are irregular or happen just a few times a year. There are a few different ways to create an annual family budget. You can start with a monthly average for the year so that each month’s budget is the same–or you can treat each month individually. We’re sharing both approaches so you can determine which one will work best for your family. A monthly average is the simplest approach to creating an annual family budget. We’ll dig deeper on how to project your income and expenses for the year in just a bit, but the basic step is to simply add all of your anticipated income for the year and divide by 12 months. That will be your average monthly income. Next, take your annual expenses from all sources – mortgage or rent, utilities, insurance, groceries, property taxes, school fees and so on and add those up. Take that amount and divide by 12 to create your monthly average. Like I said, this approach is pretty simple. The goal is to have your annual expenses be less than your annual income. The amount of money you have left over is for your savings, paying down debt, and to help you reach your goals. This tactic is a bit more complicated, but can be more accurate. You will take each month’s income and expenses into consideration. This works great if your bills fluctuate month-to-month or you have expenses that are due only a few times throughout the year. Bills that are typically only due a few times a year would be real and personal property taxes, annual insurance premiums and so on. The first step you will need to follow is deciding which approach you will use — the monthly average or treating each month separately. Once you have your method selected then you can proceed. Remember, having a realistic annual budget will help you reach your financial goals so it’s important to take your time in creating this budget. 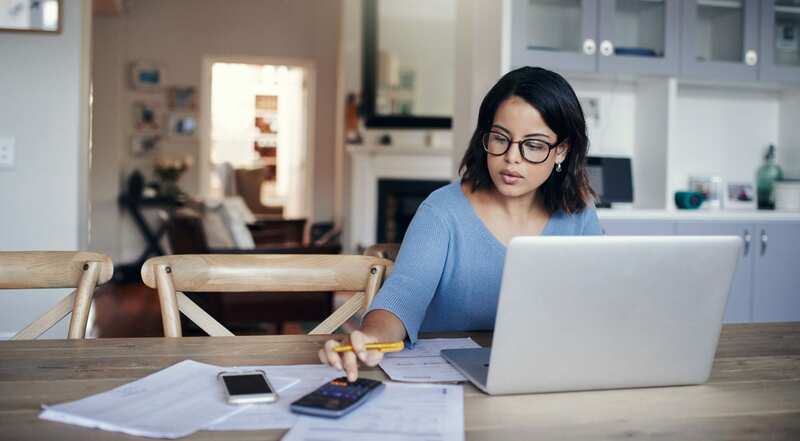 You will need to determine how much you typically spend in a year between bills, expenses, miscellaneous spending, and any other financial obligations. The easiest way to tackle this step is to pour over last year’s spending habits. Grab a highlighter and start organizing your statements. Go through month by month and add up each category so you can determine a 12-month average. You will need to understand your spending habits to better project what you will spend in the upcoming year. Determine your annual net income by subtracting your expenses from your income. If you have a positive cash flow then you can decide how to use that extra cash by either applying it to your debt, putting it in savings, or towards another financial goal. Make sure any money left over that you will use for a separate purpose (debt, savings, etc.) is then added into your annual budget under the correct category. If you look at your cash flow and you end up with a negative number then you will need to make adjustments to your expenses. Variable expenses are the easiest to adjust first. You may have to cut down your eating out, entertainment or other categories to balance your budget. Now that you have decided on which approach you are going to use — monthly average or treating each month separately, you can create your monthly budget. A monthly budget will help to keep you on track with your annual family goals. Next month, we’ll be walking you through these next steps.